The t regression models provide a useful extension of the normal regression models for datasets involving errors with longer-than-normal tails. Homogeneity of variances (if they exist) is a standard assumption in t regression models. However, this assumption is not necessarily appropriate. 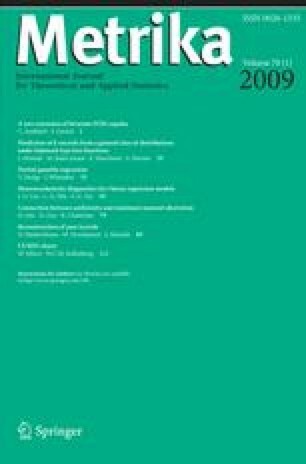 This paper is devoted to tests for heteroscedasticity in general t linear regression models. The asymptotic properties, including asymptotic Chi-square and approximate powers under local alternatives of the score tests, are studied. Based on the modified profile likelihood (Cox and Reid in J R Stat Soc Ser B 49(1):1–39, 1987), an adjusted score test for heteroscedasticity is developed. The properties of the score test and its adjustment are investigated through Monte Carlo simulations. The test methods are illustrated with land rent data (Weisberg in Applied linear regression. Wiley, New York, 1985). The project supported by NSFC 10671032, China, and a grant (HKBU2030/07P) from the Grant Council of Hong Kong, Hong Kong, China.